Avocado toast is a stereotypical Millennial food, so add a twist to it by putting a fried egg on top. It's easy and cheaper to make yourself. Ok, today I am going completely Millennial with you all and sharing a recipe for avocado toast. This recipe comes from Justin who likes avocado a lot more than I do. I can add a bit to a taco or something like that, but don’t like when it’s the main flavor in a food. A few weeks ago we had some avocados in the refrigerator that were perfectly ripe, but nothing to do with them at that time. Justin decided that he wanted to make some avocado toast with a fried egg on top, and went to work in the kitchen while I happily ate my bowl of cereal! I was making fun of Justin, saying he’s a typical Millennial because of the comments from Millionnaire Tim Gurner saying that Millennials aren’t buying homes because they spend all of their money on avocado toast and coffee. It’s such a laughable comment, it’s become a joke. Yes, I agree that it seems silly to spend so much money on things you can make from home, but two food items are not responsible for an entire generation’s frame of mind. Anyways, back to the recipe. Avocado toast is one of easiest breakfasts you can make at home, and it’s so much cheaper than buying it out somewhere. Avocados here costs $0.68 each, and a loaf of bread is about $3. That loaf usually has about 20 pieces of bread, so assuming you make two slices per day, using one full avocado between them, each serving would average $1. This is probably one of the most frugal breakfast meals you can make. Even adding the eggs, you are looking at about $1.50-$2 per day, plus about 10-15 minutes of time. 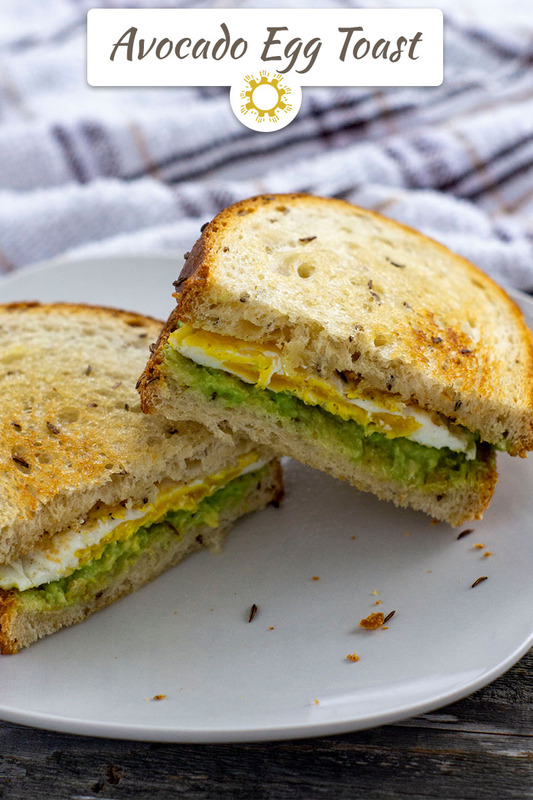 An added benefit of the avocado egg toast breakfast is the number of nutrients in an avocado, plus the protein and other benefits of the egg, on top of bread, means you will have a very filling early morning meal leaving you full until lunch. First, make two slices of toast in your toaster. They can be cooked to any degree of toastiness, whatever you prefer. I like my toast barely cooked, Justin likes his a bit more crunchy than me. Slice open your avocado being careful with the pit so you don’t ruin your knife. I find it best to slide the knife in longways, just until you feel the pit, then work around in a circle until the two halves pull apart. Use a spoon or avocado tool to pull the avocado out of the skin (discarding the pit), and use a fork to mash it in a bowl. The more ripe the avocado is, the softer it will be, thus easier to smash. Add a pinch of salt and pepper, and a splash of olive oil to taste. Spread the avocado between the two pieces of toast. Make two fried eggs, one for each piece of toast, by following the recipe HERE. You can make the fried eggs any way you want. Justin like his cooked over-hard, but you can certainly make them over easy as well. Place one egg each on top of the avocado, and enjoy your Millennial breakfast! Avocado toast is a stereotypical Millennial food, so add a twist to it by putting a fried egg on top. It’s easy and cheaper to make yourself. AVOCADO + EGG = DYNAMITE PAIRING. UGH IT IS JJUUUSSSTTT SOOOOO GOOOODDD!! 🙂 You are making me drool! I just recently tried avocado and egg on toast and I am now obsessed! If you were to have someone … cough cough….. that didn’t like avocado, what would be another healthy alternative to use? You could probably try it as more of a breakfast toast and use ham to still get some protein. I’m not sure what else would substitute for the avocado. I love to do this with avocado that is over ripe. Makes for a very satisfying breakfast. You made me LOL at that avocado and millenials tidbit. But hey, I’m Gen X and I love avocados too 🙂 And avocados egg toast is just one of the best things isn’t it?? Great to wake up to this every morning. He made my idea breakfast! Yummy! If he likes truffle salt, have him give it a little sprinkle next time. Never tasted avacado.. shall try with eggs may be. Thanks for the recipe! Oh, this looks amazing! Perfect for a healthy breakfast! I’m an avocado gal! Just give me the toast and avocado, I’ll skip the egg. Yum! Yum! This is actually my favorite breakfast. I need to try your version! It is so weird my friend and I were talking about the Millennial Avocado Egg toast. I love avocados and plan to make this for my family. I’m not a millennial and I love avocado toast! It’s one of my favorite breakfasts and so easy to make. My husband would love this! He loves avocado and egg! Oh the many wonders you can do with avocado! I personally love pairing it with eggs too!